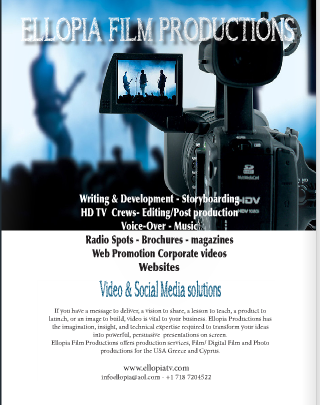 Ellopia Productions is a full service multimedia and video production company based in New York City. A winner of many top industry awards, Ellopia is the one-stop creative resource for a wide variety of more than 300 companies, ad agencies, nonprofits, associations, personal profiles and other organizations and events. If you have a message to deliver, a vision to share, a lesson to teach, a product to launch, or an image to build, video is vital to your business. And if you need video, you need Ellopia Productions. Ellopia Productions has the imagination, insight, and technical expertise required to transform your ideas into powerful, persuasive presentations on screen. Quality in any business is defined by customer satisfaction. Indigo has built its reputation by consistently exceeding client expectations. And Ellopia's achievements have been acknowledged and honored by numerous industry awards. From inspiration to realization, from concept through research, storyboard and script development, casting, shooting, editing, post-production and duplication, Indigo provides a full line of video production services. In an era where the cutting edges of technology are constantly being redefined, Ellopia Productions is committed to using the right tools for every project on an individual basis.